Despite Manchester City being erratic lately, I expected them to turn up at Old Trafford yesterday and for the first ten minutes, they did. They had Manchester United chasing shadows. In the 6th minute, Jesus Navas brilliantly beat United’s offside trap and only a poor finish stopped City going a goal up. Two minutes later, James Miner fed David Silva on the left flank who, in turn, set Sergio Aguero up to make it 1-0 in front of the Stretford End. Seeing this goal had me wondering if United’s defence will ever learn. Silva is the best player I have ever seen in a City shirt and over the years, I’ve repeatedly seen him tear down the left flank against United and set up a goal. On Friday, Louis van Gaal said that whatever happens, United must not go down to ten men. Chris Smalling scuppered that plan when he got sent off in the 39th minute after two bookings which matched the stupidity of Branislav Ivanovic at Old Traffford last week. Against a mediocre side, you can cope with a man down but against a side as good as City, it’s going to take a miracle to stop them from scoring. From the resulting free kick of Smalling’s red card, Marouane Fellaini blocked his fellow Belgian, Vincent Kompany, from heading into an unguarded net on de Gea’s far post. Vincent Kompany said in his post match interview on SKY Sports that ‘maybe the game meant a little bit more to us than to them…’. If Kompany has ever uttered truer words than that then I’ve yet to read or hear them. This was as bad a United performance against City that I can ever remember. 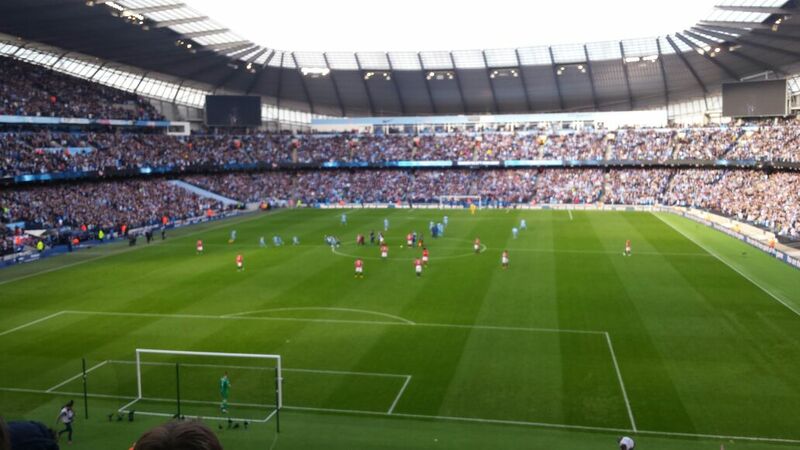 Just under two years ago, I walked away from Old Trafford having witnessed City beating United 6-1. I was consoled in the belief that even though City were deserved winners that day, 6-1 was a freak result. it was a result against a 10 man team that had gone kamikaze after they had scored a goal at 3-0 down with nine minutes to go. Yesterday was different. When Wayne Rooney scored what was arguably the goal of the match on 87 minutes, United could’ve been 7-0 down and it would’ve been a fair reflection of the game. That it was only 4-0 at the time was due to the fact that with some mercy, City took their foot off the pedal when they scored their fourth on 50 minutes with a far post volley from Samir Nasri. The last time I can remember a United performance as clueless and as spineless as this, was at the Riverside stadium, Middlesbrough in October 2005, a match that had the same result as yesterday. That match inadvertently saw the departure of Roy Keane for comments he made about the game after watching it whilst seething in a hotel bar in Dubai. With a bit of luck, yesterdays performance would have marked cards for certain players in a similar way with David Moyes. I can’t second guess the reasoning of a United manager who spurned the chance of signing Mesut Özil during a summer in which he also granted Nani a new five year contract. For all that, after what I’ve seen from both Ashley Young and Anderson in the past nine days, the only time I’d expect to see them in a United shirt again would be on Thursday nights at Moss Lane in Altrincham playing for the stiffs and even then, only in place of an injury to one of the kids. There are others, more popular terrace figures like Danny Welbeck and Antonio Valencia who must also be skating on thin ice too. There was a strange build up to this game. Superficially, United fans (myself included) were exuding confidence about having a party on derby day. Privately, myself and virtually every red I know would have been delighted with a draw tonight. United hadn’t lost a league game in nearly five months since the terrible performance at a staggeringly poor Norwich City in November. The truth is that United haven’t played well since the first half of the Chelsea FA Cup game immediately after being knocked out of the European cup just under a month ago. The two league matches since then (prior to tonight’s match) had seen United beat Reading and Sunderland by a goal to nil without really looking impressive. Everybody knew that United would have to improve dramatically on last Mondays dreadful performance at Stamford Bridge because one thing that was obvious was that City were going to be up for this game tonight. The last few days have to be the best days the bookies have had in recent memory with football scores. All weekend, shock after shock results occurred with QPR and Norwich getting beaten at home by lower and none league opposition respectively. Sunday continued the surprises with a clean sweep of shock results. Chelsea drawing away at Brentford, Tottenham losing away at the Leeds scum and the magnificent game and result at a three sided Boundary Park where Liverpool were knocked out of the cup by (come on) Oldham. That afternoon, Brendan Rodgers brief tenure as Liverpool boss reached a new depth as he gallantly blamed the young players in the Liverpool side for letting them down as opposed to his team selection and a choice that he made to leave Steven Gerrard on the bench. United and City both went through with almost mundane efficiency. On the Sunday night draw, United were for the eigth consecutive time, drawn against Premier League opposition in the FA Cup by drawing Reading at home. City were a different class to Stoke and it was only a matter of time before they got a deserved winner, which was scored by the excellent Pablo Zabaletta. That performance was replicated by City last night when they went to Loftus Road and murdered a QPR side 0-0. Another banker gone up the wall and I have rarely been so happy to see a result make a town halls of my fixed odds coupon as I was to see that draw of City’s last night. Tonight, both Liverpool and Chelsea surrendered two goal leads, Chelsea succumbed at Reading to add another fixed odds upset and Liverpool threw away a two goal lead to disrupt recently reached quadragenarian Brendan Rodgers plans to have Liverpool in the top two at the seasons conclusion. United were hot favourites tonight to beat Southampton but United were very, very lucky not to be joining all the other teams previously mentioned in the shock results.